UC Santa Cruz vice provost of academic affairs and a professor of applied mathematics and statistics, Herbert Lee, was appointed as the interim campus provost and executive vice chancellor (CP/EVC) beginning Dec. 1. 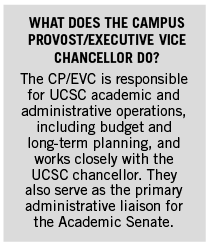 Pending UC President Janet Napolitano’s approval, Lee will take over for current CP/EVC Alison Galloway. Lee has been part of UCSC faculty since 2002 and attended Carnegie Mellon and Yale Universities. He has served as vice provost of academic affairs since 2010. The search for a permanent successor is underway, after being pushed back last year due to the candidate pool being too small. A campus committee — including SUA president Ray Inoue, UCSC Foundation President Mary Doyle, and Vice Chancellor of University Relations Keith Brant — is evaluating applications and finalists will be invited to visit UCSC later this month, Lee said. The interim position is unique in that it must leave some flexibility for the incoming permanent person. This somewhat limits the long-term scope of the interim position.